Reputed to be the world's oldest chapel in continuous Methodist use and situated in the hamlet of Newbiggin on the road through Teesdale. 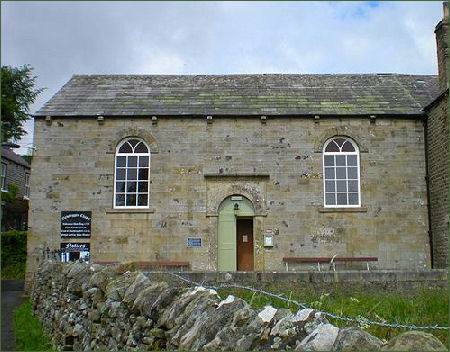 Newbiggin Methodist Chapel was built in 1759 by local lead miners. The land was purchased in 1759 by three of John Wesley's itinerant preachers and four local lead miners "whereupon to erect and build a meeting house for the use of the society in the exercise of their religious worship." The chapel has a tiered seating arrangement, pipe organ and pot bellied stove. On display in the building are exhibits relating to Wesleyan Methodism and Primitive Methodism in Teesdale and further afield. The pulpit from which John Wesley preached on several occasions can also be seen, as well as nformation about local history including material about the London Lead Company an audio tape is provided for visitors use. Open from June to August on Wednesdays 2pm - 4pm. Key is available at other times. The Chapel is 2.5 miles West of Middleton-in-Teesdale, just off the B6277 Middleton to Alston Road, and is clearly signposted. Car and coach parking is available in village hall car park.